5-HTP supplement indicated for depression and low mood. Increases production of serotonin (influencing sleep, appetite and mood). The molecule 5-HTP, or 5-Hydroxytryptophan, is found in its natural state in the seeds of Griffonia Simplicifolia, a climbing plant indigenous to Central and West Africa. 5-HTP is a derivative of the amino acid tryptophan. Once absorbed by the body, 5-HTP crosses the blood-brain barrier and is converted in the brain into serotonin, an inhibitory neurotransmitter involved in many biological processes. Serotonin plays a role in controlling circadian rhythms or bio-rhythms and is thus central to the regulation of sleep, anxiety, appetite and mood. 5-HTP is therefore often highlighted for its anti-fatigue properties and is recommended as an effective, natural anti-depressant. Given its role in regulating the body’s bio-rhythms, maintaining serotonin at sufficient levels is clearly essential. It can be produced in various ways including through the conversion of 5-HTP. The direct precursor of serotonin, 5-HTP is produced naturally by the body from tryptophan. However, tryptophan is an essential amino acid which means it cannot be produced by the body and has be obtained from external sources, either from certain foods or from dietary supplements such as our product L-Tryptophan. Ingested tryptophan is then first converted into 5-HTP and then into serotonin, by the action of vitamin B6. Research has enabled this serotonin conversion process to be simplified by extracting 5-HTP from certain plants and formulating it into dietary supplements. 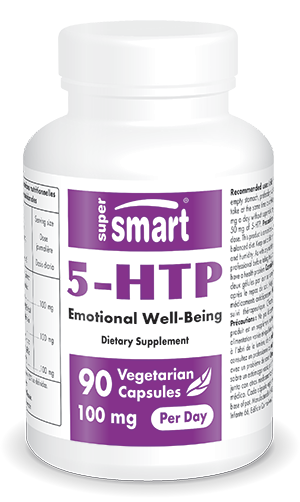 As an immediate serotonin precursor, 5-HTP benefits thus include facilitating serotonin production in the brain. 5-HTP’s role as a serotonin precursor has made it the subject of numerous studies. As mentioned, 5-HTP effects include increasing serotonin production in the brain and regulating a number of processes in the body. Its serotonin-boosting function is particularly useful since a lack of this neurotransmitter can manifest in a number of symptoms such as depression, sleep problems, migraine, food cravings, hunger, substance addiction, aggressiveness, anxiety, and obsessive behaviour. Because of these multiple symptoms, studies have been conducted on the therapeutic properties of 5-HTP, particularly for combatting stress and for treating depression and low mood. Some scientists believe it has anti-depressant effects similar to those of drugs such as PROZAC® and it is indeed often indicated for treating depression and low mood. Our product has been specially formulated to offer the properties and benefits of 5-HTP. Each capsule contains 50mg, making the recommended 5-HTP dosage two capsules a day. For optimal efficacy, they should be taken on an empty stomach, ideally two hours after a meal. Because of this compound’s effects, certain precautions are necessary. This supplement should not be taken at the same time as anti-depressant drugs and it is important not to exceed 200mg of 5-HTP in 24 hours without medical supervision. If in any doubt, seek guidance from your therapist. Each capsule contains 50 mg of 5-HTP. Take 2 capsules per day on an empty stomach, preferably two hours after the evening meal. Important: Do not take 5-HTP simultaneously with anti-depressants! Do not exceed 200 mg per day without medical follow-up.